Reishi is one of the most revered medicines in history. Known as Ling zhi in China, the folklore surrounding this magical adaptogen describes the reverence the ancient Taoists had for this life-enhancing mushroom. In traditional Chinese Medicine, Reishi is considered a spiritual herb. Ling zhi means “spirit plant” or “tree of life mushroom”. One of the top Taoist herbs believed to nourish our ‘Shen’ – the spiritual essence of our being. Reishi is one of the most studied herbs in the world, and is highly regarded in Eastern medicine. Western science recognises Reishi for its anti-inflammatory properties, cardiovascular support and as a powerful immune tonic and an adaptogen (for its ability to help us adapt to stress). Reishi really is a supreme protector on every level – spiritually, mentally, physically and immunologically. Liver, kidneys & lungs – The liver is one of the most vital organs in the body and is responsible for aiding in detoxification and helping clean, process, store and circulate healthy blood and nutrients. Reishi mushrooms work as an adaptogen to help improve liver function and prevent liver disease, allowing your body to flush out toxins and bacteria more efficiently and improving immunity against diseases that can develop over time. Immune system – Reishi enhances the monocyte, macrophage and T lymphocyte activit and the longevity and strength of white blood cells (WBC), supporting both the quality and quantity; these cells are significantly lowered during harsh treatments. Reishi has further been shown to protect from radiation and has anti-angiogenesis activity (meaning inhibits the growth of new blood vessels). 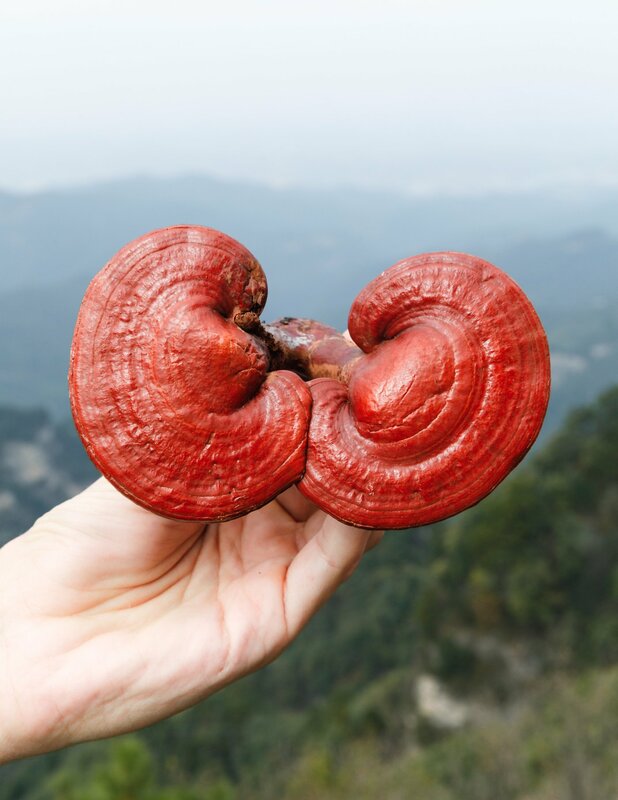 Both clinical and traditional use suggests that Reishi may be beneficial in a range of immune-related sensitivities, like acute and chronic viral conditions such as Epstein Barr Virus, rheumatism, chronic pneumonia and even HIV. Allergies – Reishi is particularly effective for allergic asthma and alleviating allergies and excessive coughing. The ganoderic acid in reishi inhibits histamine release. Reishi possesses true immune-modulatory and amphoteric action. Not only reishi supports and stimulates the immune system, when required, but it also has the ability to down regulate over active immune system. Stress management – Stress is the plaque of modern world and affects the entire body and mind system with all the stress hormones flowing and causing various symptoms. Stress is basically an inner reaction to environmental factors or self created mental dialogue about past and future. Reishi is an adaptogenic herb that supports a healthy stress response and alleviate anxiety. It also helps alleviate insomnia that can stem from stress and anxiety. Cardiovascular function – This magical mushroom has long been used to improve cardiovascular health, including to reduce LDL and VLDL cholesterol and lower high blood pressure. Clinically it has been shown to prevent and treat shortness of breath and hardening of the arteries. Get 10% off of all SuperFeast Medicinal Mushroom and Tonic products offered on this website! Our introductory offer ends on 11th of March 2019.